Although there are scams in nearly every industry, roof repair and re-roofing companies are among the most prone to fraud. Not only can an unscrupulous Arizona roofing company scam you out of thousands of dollars, they can also leave you with subpar work that will cost thousands more to correct. Since you probably don’t require roof repair often, and your Arizona home may only need re-roofing once or twice in your lifetime, it may be unfamiliar territory to you. Many Arizona resident don’t know how to tell if their roof is actually damaged, or when it’s time to re-roof, and this is just what scammers are hoping for. Knowing how to spot a roofing scam is not only helpful for individual homeowners, it is also beneficial to every Avondale, Arizona roofing company that provides good, honest service! In light of that, here are some things to watch out for. Out of town storm chasers are responsible for a major portion of roofing scams. They listen to the news to hear which areas have sustained wind or hail damage. They figure it’s a safe bet that insurance companies will pay for roof repair or re-roofing in those areas. These storm chasers often go door to door or pass out flyers offering a free roof inspection. They will always tell you that you need roof repair whether you do or not. Based on the square footage of your roof, they know what the insurance company will pay. They then proceed to put on a cheap new roof, cutting corners and doing the bare minimum. Storm chasers have no incentive to perform high quality work, as there’s really no way for them to be held accountable. They will be gone by the time you realize there is a problem. The homeowner is then left with a shoddy roof that often still needs to be replaced, and the storm chasers have long since left town. Another all too common scam involves a roofing contractor that insists on being paid before work begins, wants you to sign over your insurance check to them, or insists on an unusually big down payment. They may insist that they need the money up front to buy materials. Frequently, once they have your money that will be the last you will see of them. Like the storm chasers, they tend to vanish like a puff of smoke. Most reputable roofing companies in Avondale will have enough resources or credit available to them to perform the job without asking you for money up front. It is never a good idea to pay in full before all work is completed. Rather than skimping on work, sometimes an unscrupulous roofing company goes to the other end of the spectrum and performs unneeded roof repairs. Since roof damage often includes the wood beneath your shingles or titles and possibly roof trusses or attic insulation, it can be difficult for the average home owner to see the difference between a roofing company performing a thorough roof repair in Avondale and a scammer performing unnecessary roof repair. Many homeowners never realize that they have been scammed. You know the old saying, “if something sounds too good to be true it probably is.” This is certainly true when looking for reputable roofing company. Many homeowners can’t resist hiring a roofing company that underbids everyone else by a sizable amount. There can be many ploys used by this company. Most likely everything you thought was included in the bid was not. The company will continue to rack up charges. One of the worst case scenarios involves roofers who remove your old roof and then insist on more money before they will finish the job. The Arizona monsoon season, along with the heavy population of Phoenix and the surrounding suburbs make it a likely target for roofing scams. After the monsoons, the high demand for Avondale roof repair often keeps the trustworthy roofing companies so busy that it leaves ample opportunity for the dishonest roofers to take advantage of. In addition, the dense population of Phoenix makes it easy for a con man to disappear. 1. Check Angie’s List, Home Advisor, and ask for recommendations from friends and family. 2. Obtain at least three estimates from well known roofing companies. 3. Before choosing a roofing company, check their rating at the Better Business Bureau. 5. Find out if they are licensed, bonded, and insured. Ask to see their license and certificate of insurance. 6. Before any work is performed, you should have a detailed, written contract. If you need roof repair or re-roofing you need look no further than Arizona Roof Rescue to meet all of your roofing needs. The experienced roofers at Arizona Roof Rescue are familiar with all types of roofing materials. 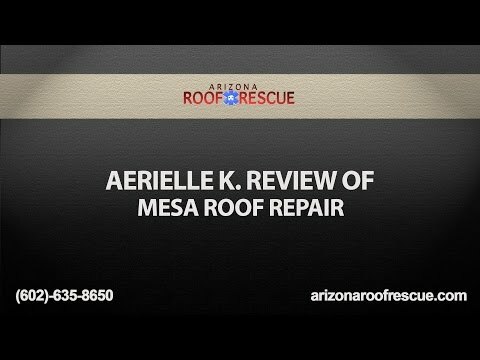 When you call Arizona Roof Rescue you will receive friendly, high quality service with a 100% guarantee on workmanship. Arizona Roof Rescue owner, Alan Monzon, stresses the significance of complete customer satisfaction at a fair price. As an example of our commitment to customer service, we offer 24/7 emergency repair services to help ensure that a small problem doesn’t become a big problem. Our reputation speaks for itself, with high numbers of five star ratings on Angie’s List, Home Advisor, the Better Business Bureau, and Yelp!